RV Parking near Public Transportation to Boston? I'm interested in RV parking near Boston. Are there any RV parking places at or near public transportation to Boston? Yes, several RV campsites are located near Boston's commuter rail, which provides transportation into the city from suburbs and towns within about a 30-40 mile radius. Of these, Salem is the closest to Boston. 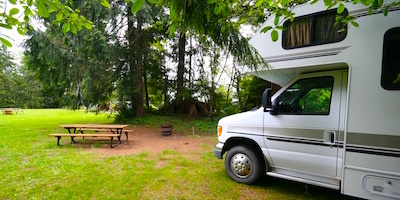 You can find more information about these three RV campsite options here. To get more information and maps for the RV parks, a good source is http://www.rvparkreviews.com. For Boston commuter rail information, go to http://www.mbta.com, and click on the Commuter Rail links. You can use these sources to figure out which RV campsite best meets your needs. You will need a way to get from the RV campsite to the commuter rail station, such as a bike or a taxi. There is no RV parking within Boston itself because it is a city and even parking places for cars are at a premium. Also, subway station parking lots do not include RV parking spaces - again, because of space issues. Here is more information about Boston's subway, the easiest way to get around Boston once you're in the city, aside from walking. P.S. If anyone else reading this has stayed in one of the parks and taken the train into Boston, please leave a comment with tips based on your experience! 1) From AB, "Parking and Ferry Ride:"
We recently took our RV to Boston. We did our research ahead of time, thanks to the comments on this website. We ended up catching the ferry to Boston and parked at the Shipyard in Hingham, MA. The cost was fairly low for 6 people. We parked the RV in two spots, costing us $8.00 for the entire day ($4.00 per space). Caught the Ferry to Boston, which cost around $36.00, this is not the norm, I am active duty military so my ticket was free, plus I have 3 children under the age of 12. Nonetheless, this is by far the best way to travel into Boston. 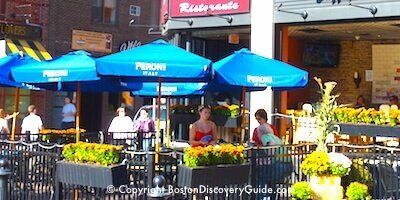 They drop you off at the Long Wharf North, by the aquarium and the Freedom Trail. There is so much to do in that general area. Be aware where the return ferry is, we had to go to three separate wharfs to finally get back to our RV. 2) From ScreaminSites, "Don't go thru the tunnels in Boston ..."
Yeah, I own a 33' RV, and parking is an issue in Boston. So are the 2 drivers who take up 2 spots each. I could have fit there. Don't go into town during the week, best time to try to get parking is weekends, Early, like 6-7 am. There are some "free" spots, but you gotta know the city, depending on what area you want to be in. The other problem is there is a 2hr limit on meters. Don't get caught going through the tunnels in Boston, $500 fine for the propane you carry, Hazardous Materials. Yeah, they got me. Follow the Green HC signs (hazardous cargo). Don't go down to the waterfront area either.